The airline declined to release any figures, but the Web site FlightStats.com said Northwest had canceled 77 flights as of 4 p.m. CDT Friday. The flight-tracking service said Northwest had canceled 48 flights on Thursday. In a letter to staff, Northwest Chief Executive Doug Steenland said the absences had primarily affected flights on narrow-bodied aircraft. "We are operating under the assumption that we will see increases in cancellations on Saturday and Sunday as well," Steenland wrote. "With our high summer load factors, these cancellations will present an operating challenge as we use our best efforts to re-accommodate our passengers." In a hotline message to pilots on Friday, the Northwest branch of the Air Line Pilots Association said that it didn't believe there had been any improper use of sick time. However, the union said, if there had been an increase in sick time it was caused by increased flying hours. The union has said Northwest doesn't have enough pilots to fly its full schedule. 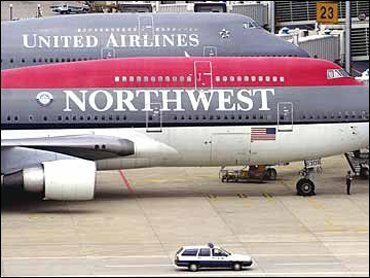 Northwest pilots have generally flown heavier schedules since agreeing to a new contract with the airline while it was in bankruptcy court. Northwest emerged from bankruptcy May 31. Under their current contract, Northwest pilots can fly up to 90 hours per month, up from 80 hours previously. The system counts only the time from when the plane is pushed back from the departure gate until it pulls up to the arrival gate, not any preflight or postflight work. The Eagan-based carrier, which canceled more than 1,000 flights in the last week of June because of pilot availability and other factors, announced earlier this month that it had thinned out its July schedule and cut its August schedule by 4 percent to try to prevent a repeat. Northwest also began recalling its furloughed pilots and said it expects to hire 200 to 250 pilots in the next year. However, furloughed pilots must be retrained before they can resume flying. "We are confident that the measures we are taking will address and remedy our operational challenges," Steenland wrote Friday. "The unfortunate reality is that a problem such as this cannot be solved overnight. The steps we are taking — schedule reductions, new pilot training, changes in pilot bidding patterns and other remedial measures — take time to implement. We are implementing these changes as fast as possible." The carrier also saw an increase in cancellations last weekend — 51 last Saturday and 58 last Sunday — but said 36 were for maintenance issues.